First Line: "Today is my last day as Violet Lasting." Review: Wow what an ending! I really hate cliffhangers especially the insane ones like the one The Jewel ended with but it makes me eagerly await for the next book so job well done. 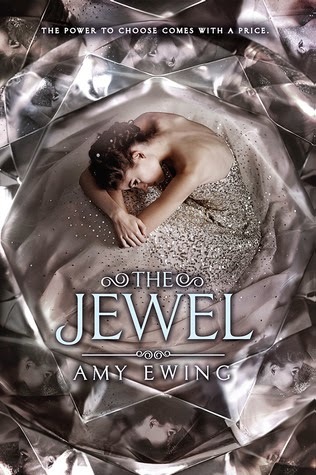 Jewel is about a girl living in a world where the Royals can not carry their own children so they get the poorest of the girls who have a certain genetic mutation to be their surrogate. Only thing is these girls never had the choice to be a surrogate they are taken from their families and sold to royalty like slaves and treated in the most cruelest of ways by them. The world Ewing carved out for us in The Jewel was downright brutal there was so much more going on then just the surrogates the only thing I wish she delved deeper into was the Auguries I'm really hoping she gives us a better understanding of it all in the next book. As far as the characters some were pretty well developed I liked Violet although she definitely has some growing up to do still. There are quite a few characters that can do with more character development instead of just being one dimensional. The Duchess of The Lake's son is the one I need to know more about he didn't have any real character development in this book but the whole time I just knew there had to be more to him then what was portrayed of him. My biggest issue the one that made me not love this book was the romance it was horrible.First off the love interest Ash is a complete bore and then they had the dreaded insta-love at which point I was pissed off at our main character. I would like to think it's just lust and she will snap out of it in the next book and Ewing will bring a certain someone else into her life whom she develops a relationship with in a more realistic fashion. Overall though I really did like this book even with that wreck of a romance. There is a resistance growing which I have a feeling is what the next book is mainly going to focus on and I can't wait to see more of some of the characters that I started to love which we only saw bits and pieces of in this book.